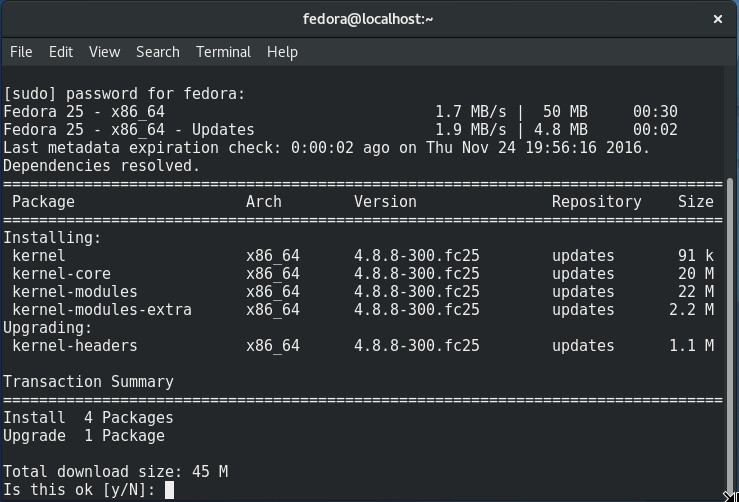 Fedora 25 has been released recently and most people want to try this new Fedora 25 on their computer via Virtualbox. 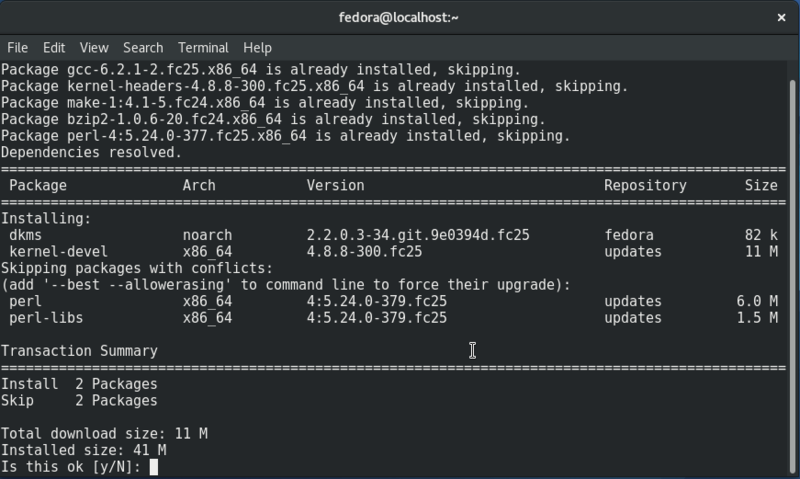 Unfortunately, Fedora 25 does not shipped with Guest Additions installed, so you won’t get full screen features on your Virtualbox with this Fedora 25 Workstation. And here I want to show you how to fix it by installing Virtualbox Guest Additions on Fedora 25. If you are willing to run Fedora 25 on Virtualbox as Guest Machine, I suggest you to allocate 5 GB of RAM to Fedora 25 guest machine. It will run faster and smoother. Execute this command to update your kernel. Step 4. 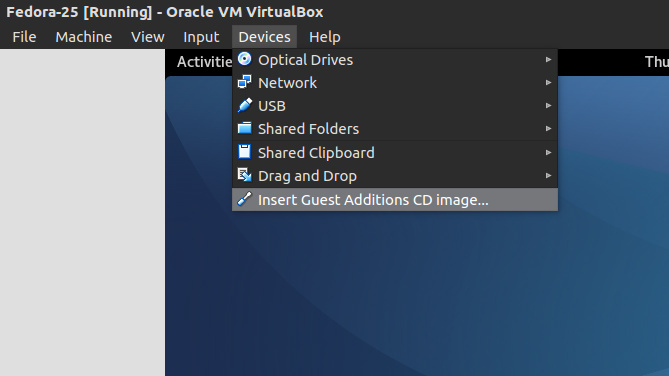 Mount Virtualbox Guest Additions. Go to Devices and click Insert Guest Additions CD Images as shown in picture below. Then you should see a new window opened on your screen and click Run to start the installation. If all goes well, you will see this kind of notification. 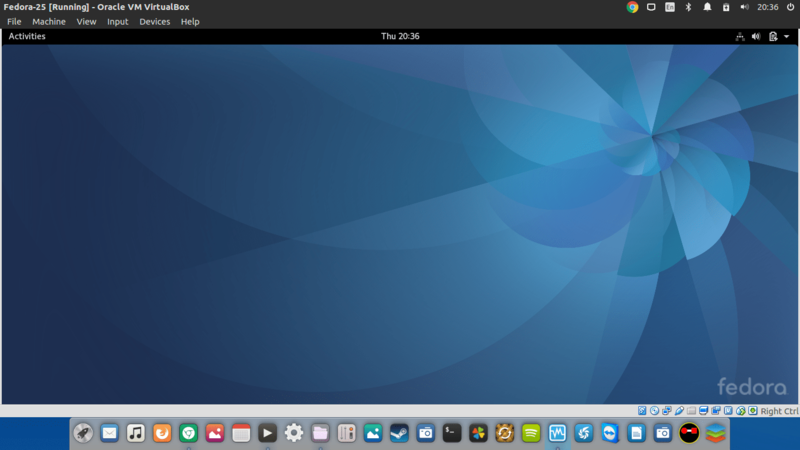 Reboot Fedora and now you should have a Fedora 25 with Virtualbox Guest Additions installed. Have a try. This is my Fedora 25 on top of Ubuntu 16.04. It’s been many years since I wrote C code. I could probably fix this but if I need to just upgrade my version of VBox, that would be easier. OK, I upgraded my version of VBox to 5.1.10, matching yours. And I managed to successfully build the vbox additions module(s). Unfortunately VBox still uses X.org for it’s graphics library. I was hoping to preview Wayland using VBox. Oh well – will have to wait for VBox to support Wayland I guess. I wasn’t able to build the VB Guest additions until I found your post. Running the command to update and install all kernel packages did the trick! Thanks for the post! This method seemed to pooch my VM. I can’t login now. I get a login prompt, but after entering my password the screen goes black then drops back to the login prompt. The login prompt screen takes up the whole VB window, so it looks like it’s trying to work. That black screen I mentioned is smaller, about the size of the VM before we tried to install the Guest Additions. For the install process I got the same sorts of screens and messages that you got. It’s just a test machine so I didn’t lose anything, but it would be nice to get it working. I’m running Windows 10 as the host, with Virtualbox Version 5.1.10 r112026 (Qt5.6.2). Please note that Virtualbox support to Wayland is not so well. So, make sure you choose Xorg from the login screen. You’re probably quite right, Ariel. I do an addendum that might be useful, though. 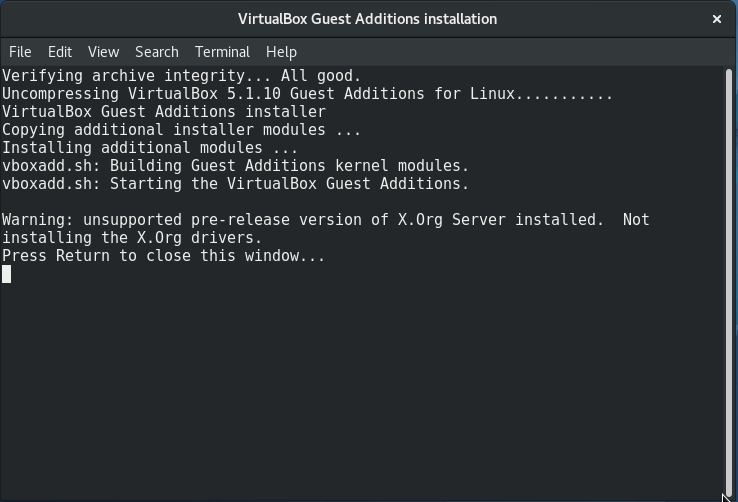 First off, I saw on other websites that it might be helpful to remove open-vm-tools before attempting to install the guest additions. I did that with a KDE install of Fedora 25 and it seemed to go well. Now whether it was the open-vm-tools removal or the fact that it was KDE and not Gnome that solved the problem, I couldn’t tell you. Thanks for your reply, though; it’s something to keep in mind. Great tip. I was struggling earlier, but after I followed your posts it worked like a charm. Found that i needed to write for this to work for me.